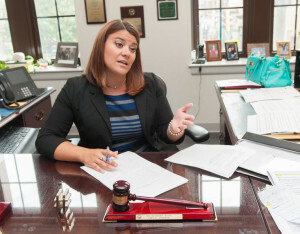 NEW BRITAIN — Mayor Erin Stewart and the founder of the Atlantic League of Professional Baseball signed a tentative agreement Monday to bring baseball back to New Britain in 2016. “I’m thrilled. It’s a home run,” Stewart said of the tentative 15-year deal with Frank Boulton that calls for his league to pay the city more annually than the New Britain Rock Cats did, but assigns all parking rights to an as-yet unnamed incoming team. Under the tentative agreement — subject to approval tonight by the Common Council — the annual rent for the first five years of the lease will be $150,000. The Rock Cats, who played their last game in New Britain earlier this month, paid the city about $101,600 annually. Also under the tentative agreement, the annual rent for the sixth through 10th year would be $160,000, and it would jump to $170,000 for the 11th through 15th years. However, the city had control over the parking when the Rock Cats played here. The agreement calls for the Atlantic League team to have that control. In previous years, city officials said, the city netted a little under $100,000 after expenses from parking. Under the tentative agreement, the league cannot charge more than $7 per vehicle for the 2016 and 2017 seasons and can charge a maximum of $10 for the 2018 through 2020 seasons. If, for example, a sponsor comes forward to give the league $100,000 to have its name on the stadium, the city would receive $10,000. Any name change for the stadium is subject to city approval. Boulton said he expects an announcement on which team will relocate to New Britain by mid-October. “I think it’s a very fair deal that will allow baseball to be continued to be played in New Britain,” Boulton said. City leaders of both parties called the tentative agreement fair.